The last couple of posts spoke of some fairly complex issues – which, for the most part, seem to be lost on many people owing to their fuzzy nature. This will be the first of three posts. Let’s take a couple of steps back and give a bit of background information which can help to make sense of the last couple of posts. This post will look at what multiculturalism and interculturalism are. The purpose of these posts do have a role to play in bridging the Two Solitudes, considering that multiculturalism and interculturalism often takes the form of a very public debate in Québec. Multiculturalism is an official government policy which several countries around the world have enshrined in laws. But it can mean different things in different countries. allows anyone, regardless of their cultural heritage, to fully participate in Canadian society, without discrimination. recognizes communities which contributed to building Canada, and to helps to enhance those communities’ development. (In practical terms, this might mean federal funding of a monument to the Irish who died in the sinking of the Empress of Ireland passenger steamliner in Québec, the funding of the Ukrainian cultural village in Alberta, the funding of the Upper Canada historic village in Ontario, or the funding of various ethnic food or music festivals around the country, etc.). (This is why we see federally funded language programs to provide English or French lessons to immigrants – with the understanding that immigrants will use the language of the majority at work & school, as will their children as they grow up in Canadian society. This is also why our government institutions such as hospitals, schools, courts & offices operate only in English and French – and why official interactions with the public are in these two languages and none others, with some cursory exceptions on trivial matters). In a nutshell, that’s that covers the majority of what multiculturalism deals with. It’s actually not complicated. There’s not really anything sneaky, and the vast majority of what it deals with is not controversial at all. We basically allow people to simply live their lives as any normal people would — just as we, and our neighbours naturally wish to live our daily lives. For the vast majority of immigrants and their descendants, what it means in practical terms is that when they move to Canada, nobody holds an unjust law against them for wanting to live life how they desire. It means that extreme measures will not be unjustly used against immigrants should they wish to retain aspects of their own cultural identity (by extreme measures, I mean the government cannot threaten immigrants with fines, jail, or even worse measures for practicing innocent and harmless things such as speaking their own language amongst themselves, or retaining normal, harmless cultural traditions). It also means we don’t tell our immigrants they must abandon their customs, and where we can, we will accommodate their customs because we recognize that they too have a role in building Canada. This can include very simple, easy-to-accommodate measures which really don’t cost anything or are not a burden to anyone. Examples might be to allow cities to provide building permits for a Sikh temple, to allow Chinese immigrants to celebrate Chinese New Year’s in a social hall, to allow school cafeterias to provide pork-free food options to Muslim students, etc. All such measures are very simple, very easy, very reasonable – and very natural. You may say that the above measures are no-brainers. But you have remember that in some countries (actually in many countries), these sorts of very basic freedoms are not allowed. In some countries, Muslims are not allow to pray and are force-fed pork meals in prisons or schools, minorities are forbidden by law to speak their language in the streets or within schools or hospitals (or to even learn their own or other languages in grade school or university), people are forbidden to convert to Christianity or any other religions, building permits are not afforded to anything which can be considered cultural or religious, and minority ethnic groups are not allowed to assemble as a group for ethnic activities (no ethnic food festivals, no music festivals, no holiday festivals, nothing). In such countries (including some of which are Canada’s very close “allies” and “strategic partners”), such people can be fined, jailed, or even worse if they’re found doing any of this. You, as a Canadian, could also be subject to such penalties if you travel to any of these countries and you engage in innocent activities such as gathering with other Canadians to celebrate something as simple as a Christmas meal, share a beer, or wear an innocent style of clothing which is popular back on the streets of Canada. So in a nutshell, there’s nothing bad or offensive about what we’re doing with “multiculturalism” – it’s simply allowing others to be treated how you would like to be treated if you were to spend time in another country. In one word, it is “freedom”. Where things become a bit blurred, and where the public hears there are “issues” with multiculturalism is when isolated and rare issues arise. Such issues are not things which involve the vast majority of immigrant minorities in Canada. However, because they involve more rare events, the media sometimes gives them disproportionate attention. This is how minor and harmless matters can instantly (and unjustly) takes on sensational proportions – to the point that some people use media examples to claim that multiculturalism is broken. One example which came up a number of years ago was when the RCMP (Royal Canadian Mounted Police) allowed a Sikh to keep his turban. The RCMP found a way to integrate it into the uniform. Does it do any harm? Is it impeding any professional function? The answer is no to both questions. Does it ruffle feathers? For the majority of Canadians, the answer would be no, but for some people it does. Why it ruffles feathers for a minority of people is an issue I’ll leave to psychologists to explain (after all, they are the ones who study why certain things perturb certain individuals). But the RCMP recognized the idea of “treating others as you would like to be treated”. Therefore the RCMP’s decision to allow turbans as part of uniforms was within the spirit of the Multiculturalism Act. The fact of the matter is this: an individual who is Sikh happened to respond to a call of duty, and said that he would be honoured to fully participate in Canadian society, as a Canadian, and join the RCMP to protect my and your lives. He agreed to possibly sacrifice his own life if necessary, in the line of duty, for the safety and protection of Canadians. He simply asked if he could keep his turban in the course of such an act – and we said yes. It’s actually quite touching that he felt he could participate fully in society, as a Sikh, and that we recognized this, and accommodated it. In this light, it shows that multiculturalism works. Such policies allow us to come together – all of us – as one country. 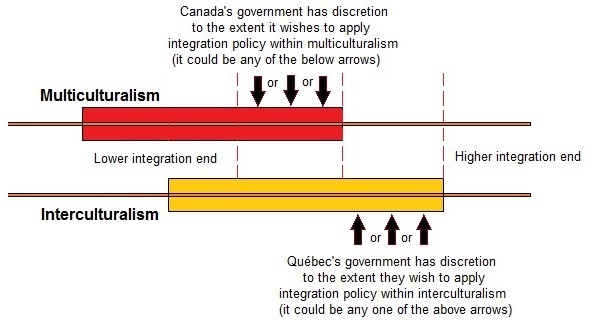 The government of Québec has an official policy named “interculturalism”. It’s the provincial take on similar federal multiculturalism issues. It’s very similar to multiculturalism, with the only major difference being that it is packaged with a slightly stronger emphasis on integration, along with a different name. The government of Québec’s definition is also quite simple and short. – affirms that French is (and will remain) the public language of Québec. That’s it. It is very straight forward, very uncomplicated, and very open. – Because Québec is a Francophone society made up of people of many different backgrounds, immigrants need to abide by the Québec Charter of Rights and Freedoms (which was actually a model for the Canadian Charter of Rights and Freedoms – they are very similar). It implies that immigrants contribute to building Québec (in a social sense, regarding language and customs) by cooperating with Québécois people. – When multiculturalism in practised in Québec, it works in tandem with Québec’s interculturalism. Thus, the two ideologies do not clash (there has been no proof to show they clash). – Interculturalism, like multiculturalism, does not have a forced assimilation policy (nobody is holding the threat of fines, jail, or worse against immigrants to compel them to reject what they hold dearest about their own personal identity in the name of becoming exactly the same as Québécois or Canadians). – Canada, outside Québec, does not have institutionalized language learning programs with which to expressively integrate immigrants into society. But Québec does have institutionalized language learning programs for integration (English Canada has optional English programs such as LINK. But as Andrew Griffith pointed out in the comment section of my last blog post, immigrants in English Canada traditionally self-integrate with English as their societal lingua-franca. However, in Québec it would not necessarily be the case that immigrants would integrate with French as their main societal lingua-franca, thus Québec requires immigrants to undergo French language training in certain circumstances). – interculturalism seeks to counter the attraction of settling in Québec solely based on the attractive forces which federal multiculturalism holds for immigrants. Therefore, interculturalism contains a more expressive and attainable integration component, separate from other elements which are shared by both multiculturalism and interculturalism. But this integration component of Québec’s interculturalism does not go as far as “assimilation”, nor is it as “loose” as multiculturalism. – multiculturalism allows for bilingual integration, whereas interculturalism funnels immigrants towards French language integration (with no funneling towards English). – interculturalism seeks “language security” for Québec in the various aspects of life (work, education, and government), whereas such policies are not needed (and do not exist) in multiculturalism because elsewhere in Canada, English does not need “security”. This is because English is not perceived to be under threat in the absence of language protection policies. Graph 3: On a parallel scale, this graph can give you an idea of how governments have flexibility to decide what emphasis they can allot to integration, as a policy, within multiculturalism and interculturalism. A few days ago, in my post entited “Multiculturalism Redefined?”, you may have read Andrew Griffith’s comments and feedback to my post (his comments are at the bottom of that post). Andrew is actually one of Canada’s foremost published experts on multiculturalism. I appreciated his comments, and I would encourage you to read his blog, Multicultural Meanderings. It makes for very interesting reading. In my last post, Andrew commented that the Conservative government is according a higher degree of integration policy within the realm of multiculturalism (refer to Graph 3). As you read in my last post, it appears that Justin Trudeau, based on his own definition of multiculturalism, is prepared to accord a higher degree of integration policy within multiculturalism (his definition is very similar to the Conservative government’s policy). This higher degree of integration is not incompatible with Québec’s own stance, as applied within interculturalism. I believe that the Conservative government’s and Justin Trudeau’s Liberal stance, which leans heavier on the integration side, makes is so Canada’s federal multiculturalism is now much more compatible with Québec’s interculturalism, perhaps more so than at any point in the past. In my last post I also made a very specific point of stating that the difference between Canada’s multiculturalism and Québec’s interculturalism is not very big. A person can think of them both as being quite complimentary – both working together to meet the needs of Québec. In areas where multiculturalism may not meet all the needs of Québec’s society, interculturalism is then applied by Québec’s government to add an additional layer which facilitates a more specific type of integration – unique to Québec’s societal needs. The next post will look at more controversial aspects of multiculturalism and interculturalism (they both share the same controversial aspects). It will also look at something called “reasonable accomodation” which gets a fair deal of media attention in Québec, and sometimes elswhere in Canada also. By Quebec Culture Blog 101 in Political Related on February 16, 2015 .